A few months ago I went hiking on the Monk’s Trail to Wat Pha Lat in Chiang Mai. My arrival to the Buddhist temple was accompanied by a sense of wonder and amazement. The scenery in which the temple is located was unexpected to me. An inaccessible staircase stopping abruptly in front of a waterfall was my visual welcome to the temple’s surroundings. My physical welcome, though, would have to wait a bit. I sat down on the dry surface where the waterfall tends to flow during the rainy season and from there I watched quietly the monks making their way through the trail to pray at the shrine or to continue to Wat Phra That Doi Suthep. I could see the city of Chiang Mai in the distance, as a contrasting busy background to this tranquil space. It was a happy and serene moment. The peace and quiet I felt there made me realize how lucky I am to experience places like this. All those hard working years and all that saving led me to that moment, yet I knew, that was not the climax of my trip. There’s more to come. It’s been now three years since I quit my job to travel the world, yet I’ve never shared here why I quit. It would be nice to say I left on a quest to find myself or that I had a life-changing moment that spurred me out of my quotidian life and into the world, but that’s certainly not true. I simply wanted to see the world. I wanted to learn from it and soak it all like a sponge. 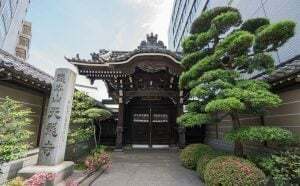 I wanted to see all those architectural masterpieces I had studied in school and go beyond the well-known architectural standards by introducing myself to the lesser studied archetypes and cultures. But one thing is saying “I want to do this” and another thing is actually doing it. One of the train stations I studied in college. 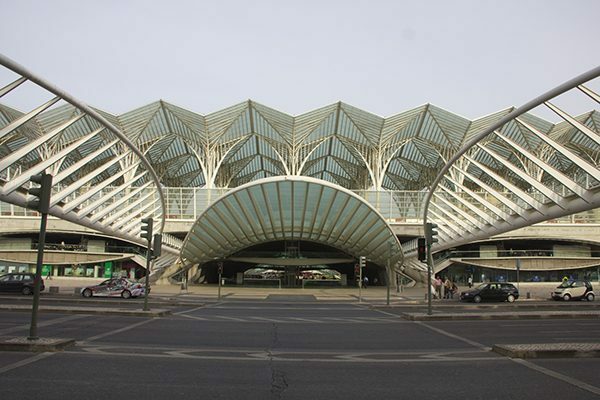 Designed by Santiago Calatrava. Throughout this longer than expected trip, dozens of other travelers have asked me how I managed to make this decision. Was it easy for me to quit and travel? Am I running away from something or from “real life” responsibilities? Why did I want to travel like this and leave it all behind? How do I see this as a life? Where is home and when do I plan to go back? They want to understand the why behind my decision to travel indefinitely instead of satiating my thirst for travel with the customary 2-week vacation most people in the US workforce have. Truth is, after years of working in an architecture firm in New York, I realized that those 2 weeks a year were not nearly enough. I liked the firm where I worked. I liked the projects, their vision and design, and I believe I was a good employee. Still, every time I had the chance, I escaped the cubicle to travel anywhere for the weekend or during my normal vacation time. I slowly noticed how through the years my attention during work hours spanned more towards browsing the internet to search anything travel related, than to do anything architecture related. At work, at any given break I would close AutoCAD or Photoshop to plan an imaginary trip – which made it even more exciting when the actual plan materialized into an escapade every now and then. I was truly a semi arm-chair traveler. However, I didn’t want that status for too long. While my round the world travel desires grew exponentially when I was working, the travel seed was planted in me several years ago. I come from a family that loves traveling, and even though they haven’t traveled in this style, we always used to travel as a family to anywhere we could, at least once a year. Me! 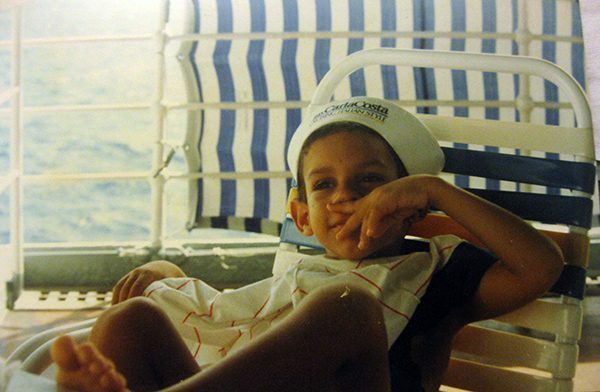 In one of my first Caribbean cruise trips with my family. I first learned about the fact that people could travel around the world for long periods when I was in high school. Back then, my 17-year-old self dreamed of visiting several countries while circumnavigating the world. It was just a dream back then, but I remember spending long nights planning the perfect round the world trip that would take me to Australia, Japan, China, Morocco, Europe, and a bunch of places. While in college I visited Europe for the first time, and there, while visiting Sagrada Familia, I got inspired yet again to travel more to see more wonders around the world. But, I had absolutely no money and was focused on getting my college degree, so that dream was carefully shelved so it could lay dormant and slowly marinate in the back of my head. I never let it die because I knew that at some point in my life I would do it. I just didn’t know how soon it would be. 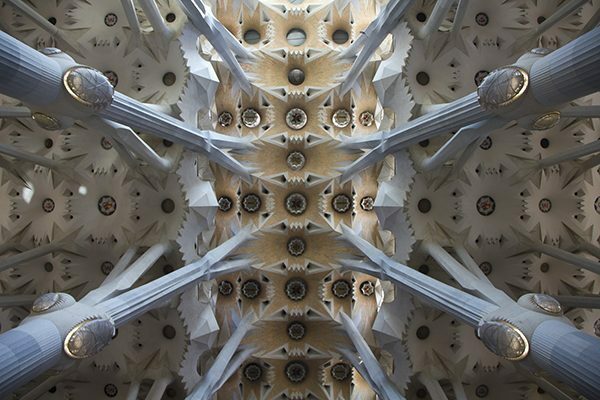 The intricate ceiling of Sagrada Familia. It didn’t look like this when I saw it for the first time in 2003. In fact, there was barely any ceiling in 2003. Another “push” to travel came from my college years, where I learned a lot about architecture, but it was mostly centered in the history of European architecture and the early civilizations like Ancient Greece, the Ottoman Empire, the Roman Empire, and such. What about the architectural history of the Mayas? The African tribes? The Southeast Asian civilizations? While my education was good, it was still limited by a narrow funnel that only looked at the greatness of the civilizations that served as the precursors of our modern life. But, they should not be the only ones to be studied. I wanted to learn and see more about world architecture, so I knew I had to do it on my own. Fast forward to my last year working in New York and you’ll see that not much happened with that round the world trip idea I had about 11 years prior. But, this last year in New York was quite influential in my “sudden” departure. I tried changing my life the traditional way by looking for another job, moving with roommates, and going out more often. This was 2010 when jobs were scarce, so I didn’t have an option but to stay at my current job, which luckily was stable. Still, the travel bug kept pushing harder and harder until it made me shift focus. My wanderlust was no longer a want, but it had already morphed into a need. I would use travel to change my current life in New York! Sounds easy! Well, it wasn’t. I started by creating this blog, but beyond that, I had to discipline myself to save more money than ever, I had to figure everything about living on the road, and I had to trust that I could do it. The latter was the hardest of them all. Then the decisive day came. At work, during those recurrent mental travel lapses, I searched Twitter and found a very cheap flight to Nairobi. I debated for hours whether to buy the flight or not until a sudden impulse made me do it. Buying that flight was the most thrilling thing ever. The adrenaline ran through my body and all kinds of feelings overpowered me; fear, joy, nervousness, excitement, you name it. 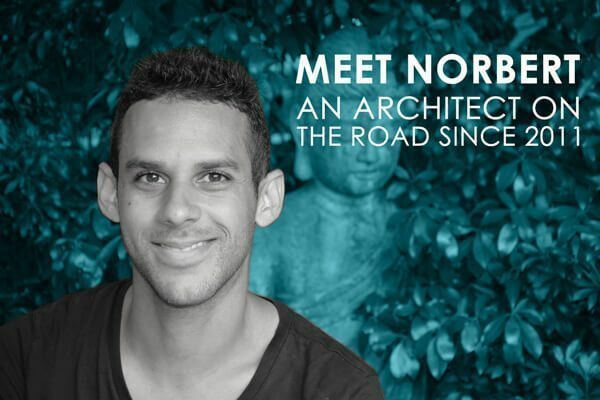 Even though my departure was still 9 months away (which actually turned out to be sooner than expected when I quit just 4 months after), that flight made me commit from that point on to become a nomad and leave my life behind. I want to be remembered as a person who wasn’t afraid to start things. I left New York to fulfill the dream of seeing the world through my own eyes. I wanted to be happy and live life on my own terms. So, here I am in Chiang Mai, three years after I left. I consider myself a happier, healthier, wiser, and more relaxed person than I was before. I have thousands of stories and experiences that have made me laugh, cry, fear for my life, and grow as a person – all of them set in some of the most fascinating places on earth. My long anticipated one-year around the world morphed into this dynamic monster that has endless desires to see more of the world. The more I travel, the more I want to see and learn. I want to devour it all. I’ve been very blessed to be able to embark on a journey of this magnitude. I don’t take this for granted and I still work hard to keep this dream a reality. Yes, to me, traveling is still a dream I want to continue pursuing. It’s reassuring to know that quitting the ideal life to follow your heart and to make your life exactly what you want it to be is not completely crazy. I’m at that point where I’ve made the decision to try to achieve that inspite of the uncertainty. No, it’s not crazy to follow your heart/dream if you truly believe in it, feel it, and of course, work and plan for it. Sure, it’s motivational posts like this one that also kept me going when I was thinking of traveling. this is an awesome story, and kudos to you for making it work! just starting my journey and I hope 3 years from now I can write a post like this. Thanks, Christina! Congrats on starting your journey and yes, I hope that you reach all your goals on this trip! Great story! It’s quite similar to mine (I also took off in 2010), though now I find myself in NYC! 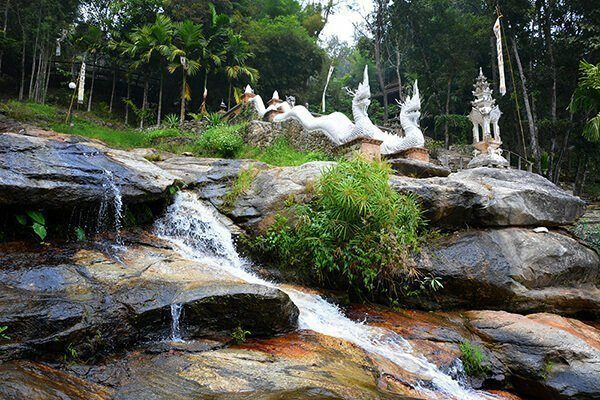 What Pha Lat truly is an inspiring place. I have incredibly fond memories of the peace I found there. I raise a beer to you, and hope we can share one someday! Thanks, Jeremy! Oh yes, Wat Pha Lat is one of my favorite temples here in Chiang Mai. I raise a beer for both and yes, hopefully we’ll do it in person some day. By the way, I’m going to NYC in November, if you’re still there. Hi. I love what you did with your life and I onr day look foward to living up to my ambitions of discovering the world. I am wondering how you supported yourself throughout your travels? Did you have a strong base of money saved or did you manage to work some jobs around the world? Thanks for your time and have a nice day! Sure, before quitting I saved money from my day job and at the same time I worked to develop this blog to generate some side income (at that time) which eventually became my main income. I left NYC with $18,000. That was ok to serve as my reserve as I wanted to rely more on the money generated from the blog. I also write freelance for a few publications. If you have any other question, feel free to let me know! Hi, I am on the way to follow your steps and this post is really motivating for dreamers like me who want to travel full time. Keep up the good work. I want to ask about how soon did your blog start giving you financial benefits? I ask this because I am in the process of setting up a blog currently and am planning to leave my job according to when it starts giving me some money. Also, was your blog the only source of income while your travel or you also did different jobs in different countries/places? Much appreciate your response in advance. It will really help me in a lot of ways. Thanks! Regarding income from my blog. It started generating “something” about 6 months after I started it – with a lot of works involved in it. BUT, it didn’t become “an income” I could really use to travel until after 2.5 years or so. It’s been growing slowly, but steady. Have in mind that not all blogs are the same. Some of them take off with no problem and generate great income while some (most of them) never get to generate anything at all. My recommendation is to only do a blog because you WANT to do a blog, not because it could bring you money. You could work on it for months and not make a cent out of it, and if the money is your motivation, then you’re gonna get discouraged immediately. Ont he other hand, if you’re doing it because you’re passionate about it, you’ll stick to it on the long run and might have more chances of succeeding. Regarding jobs… I’ve never worked in different countries (as in odd jobs), but I still do practice freelance as an architect every now and then. Yes, “see it all” is pretty much the only item on my wish list, dream list, or whatever people want to call it. I was fortunate to travel for 14 consecutive months. Although I saw so much, I feel like I have not seen anything. Best wishes to you! Great Post and And amazing pics I like train Station pic more.Thanks for Sharing Great Experience. Really commendable..it’s really a pleasure to know of somebody who’s out to follow his passion and not care too much about the materialistic things of life..Like u, even my life revolves around travelling. .I even run my own website http://www.travelwithrohit.com. But just wanted to know..I m myself planning to quit my job n follow my dream..dream of travelling n exploring..I have even done some savings to finance it..but what happens when I finish my saving off..how will I take care of my finances? ?? Thank you so much, Rohit! Well, I would recommend that before you quit, if you plan on traveling long term and stay on the road even after your savings are over, you must first have a plan or an idea of how will you support yourself after your savings are done. Will it be by settling in different places and working from there? Having your own online business you can work from anywhere in the world? Doing odd jobs here and there? There are several ways you can do this, but you should build the foundation before you leave so you have at least something to work on while on the road and have time to develop it. I’ve written a few posts on this topic, in addition to an ebook about how I’m managing this lifestyle and other tips. Hope they help! No matter what country you go to, people put their pants on one leg at a time, so to speak. Even though different cultures can be vastly different from one another, most humans share quite a few common experiences. Agree… we are all humans in the end, so we share many of the same qualities and feelings. Great to hear from you after all of those great years in the UPR School Of Architecture. Hope you enjoy your journey around the globe! Its really a good blog on Trip to world. I appreciate your article. Discover the outside world and collect information through our site. This blog is really helpful to give a light in this issue. So thanks for sharing all that important information. I really loved this article. I’ve traveled to 27 countries, and my husband has been to over 70. I actually still wish to have a destination to call home and now that we now have a 22-month old daughter, traveling is a little trickier but so worth it! Thankfully all my work is done online. Cutting free from an employer is so freeing! The job travel around the world presenting some different reason and searching their every concept. Hi – My blog pretty much supported me throughout my travels but I also saved money for over a year before I left to help with costs. I only worked with the blog, so no, no random jobs around the world, though that’s a very valid option for a lot of people. Loved the article man, I wish I would have seen it back in 2014 when you first wrote it. Are you still living the traveller life style or have slowed down? Sorry for asking this but how old were you when you left NYC? Hi, Gabriel! Yes, I’m still traveling the world! I have my moments when I slow down a bit, and then I have a few months of intense travel. I was 28 when I left NYC in 2011. I wanna travel around the world like you but I can’t quit my job because I don’t have enough brave. It’s not simple like you did it. Too many things I have to take care like my child or money. If you really want to travel but feel like you can’t, I recommend you start small by taking small steps and begin with a few small trips in your country. 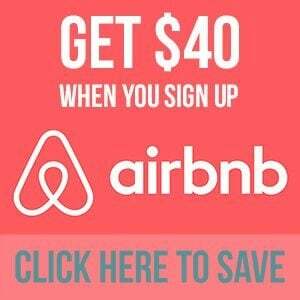 Then save some money to travel to neighboring countries, and so on. It might take time to save money, but have that goal in mind and work hard for it. I believe that one day you could at least take a few weeks to travel to a few countries with your child and family. I get those “jealous” comments very often too, and they also come from people whom I know can travel more than they do. It’s all about priorities in life and how you approach it. Maybe they feel jealous of your travels, but they aren’t doing anything in their power to do the same, so the most comfortable thing is to sit back and feel the jealousy (which is many cases is not the bad type of jealousy – it can also be admiration). In some cases, it is our job to turn that “positive jealousy/admiration” into the “drive” that can help them do the same thing. Share with them how you’ve achieved everything you’ve done. The ups and downs, and how changing your priorities changed your way of seeing/affording travel, and so on. I am guessing you took that photo in Australia? 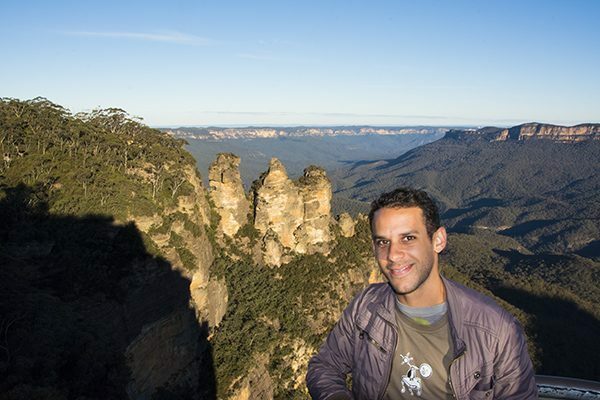 It looks like a place near Sydney i visited with that rock formation called the three sisters or something like that. That is correct! Those are the Three Sisters! That’s a wonderful story, my partner and I are spending a month in Chiang Mai province right now, as a result I had to leave my job. The idea is incredibly appealing and I want to live my life traveling an experiencing more than just a work work work all day life. However, it’s not as accessible to most of us. Not all of us are lucky enough to make piles of cash at an architectural firm in a big city and have the ability to save up enough to fund this adventure. We’ll keep trying but for now we’ll have to go back to the North American city life, at least for now.